Alolan Ninetales-GX is a Stage 1 Fairy Pokemon-GX, 200 HP, with a Metal Weakness, Dark Resistance, and a Retreat Cost of 2. Its Ability Mysterious Guidance lets you add 2 Items from your deck to your hand when you evolve into Alolan Ninetales-GX. 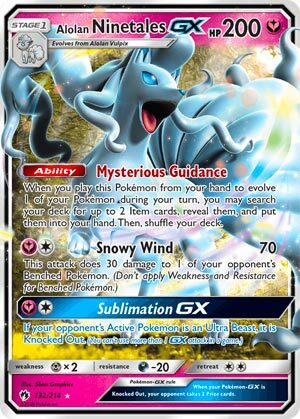 Silver Snow Wind then is a 2-for-70 that does 30 damage to one of your opponent’s Benched Pokemon, and for the same cost, you can use Sublimation GX, which will KO the opposing Pokemon immediately…if it’s an Ultra Beast. Mysterious Guidance alone deserves merit for running Alolan Ninetales-GX, since all you gotta do is evolve it, and then it nabs you any 2 Items you want from your deck. Never mind that on top of that you get what is barely a weaker Night Spear attack; for 1 Energy less, you get to do 20 less damage but keep the snipe effect, which actually makes this a nice trade-off. Sublimation GX though doesn’t seem like it would see use at all, but consider that some of the most prominent decks of the format…well, the MOST prominent deck of the format, runs Buzzwole-GX, an Ultra Beast. It can be worthwhile to rid yourself of one with the GX Attack. Arora Notealus: Alolan Ninetales has received a lot of great cards in recent memory. Between this card, its Luminous Barrier non-GX version, and the other GX, Alolan Ninetales could be its own deck if so desired. Probably not recommended, though, given the shift between two different Types, but definitely a lot of competitive potential for the Alolan Ninetales as a whole! Next Time: Where does all this lost thunder come from anyway? It’s time to look at another Alolan Ninetales-GX card from SM Lost Thunder. Some aspect of the card that’s already been established is being a GX Pokemon, including better stats, possibly better effects, a GX-attack, giving up an extra Prize when KO’d, and various effects that include or exclude/hinder it. As a Fairy Type, it can strike XY-era dragons for double damage, as well as making use of old and new specific cards in the card pool. It is a Stage 1, so it won’t be fast or efficient than being a Basic, though it has one trick that can help bring it to play. Alolan Vulpix (SM Guardians Rising 21/145) is the one you should be using as its Beacon attack lets you grab two Pokémon from your deck into your hand, and this attack doesn’t require any energy to use. 200 HP is adequately durable except for Metal Weakness; Dark Resistance helps a little, and a retreat cost of two is somewhat of an inconvenience. Alolan Ninetales-GX has an ability and two attacks. Mysterious Guidance only works when you play this from your hand to evolve one of your Pokemon. When it does, you get to fetch two item cards from your deck into your hand. This is actually good, as it lets you search your deck for cards that you want to use right away. Item cards can be used as many times as you like, and you can even grab Pokémon Tools, which is also under the item category. This also thins your deck so that you have a better chance to draw into the cards that you’ll need, whether it be straight-draw, top draw, or even shuffle-based draw. There’s too many examples that you can think of and even change the game around, even if it’s just two item cards. Ball related item for search, hammers for disruption, potions and bounce items, damage boosting items, and much, much more. Ok, so the ability is good and all, but what about two other attacks? Both of its attacks costs YC. Silver Snow Wind does 70 damage to the opponent’s Active and 30 damage to one of your opponent’s Benched Pokemon. Attacks like these has historically seen play as it helps soften the damage you need for your other attacks to secure the KO. This attack is like the middle road, between the power of Jet Punch or Night Spear. Despite good value for less energy, the damage cap is still a concern. Choice Band can help 2HKO Basic EX/GX Pokemon, but the rest is being 3HKOed, and that’s way too long. Sublimation GX applies if the opponent’s Active Pokemon is an Ultra Beast, and if it is, it is instantly Knocked Out. This GX attack is extremely specialized, as it doesn’t work on anything else besides Ultra Beasts, and they could be GX or non-GX Pokemon. So how do we use it? Thanks to Alolan Vulpix’s Beacon and the Mysterious Guidance Ability, you can easily get a Stage 2 into play. Again, too many examples that I can’t list them all; you might as well call this Alolan Ninetales GX/ insert Stage 2 name here deck. Ideally, you would want a Stage 2 Pokemon (GX or not) with useful abilities that can help your deck. Decidueye-GX for bonus damage counter placement; Gardevoir-GX for fairy centric decks; both Solgaleo-GX for free switch or removing weaknesses, the list goes on. Or it can be used on its own, or even another Alolan Ninetales-GX card. That’s right! There’s a older Alolan Ninetales-GX (SM Guardians Rising 22/145, 132/145, 150/145). It is a Stage 1 Water type GX with 210 HP, weak to metal, and a retreat cost of one. Ice Blade costs CC and does 50 damage to one of your opponent’s Pokemon. Blizzard Edge costs WWC for 160 damage, and discards two energy from this Pokemon. Ice Path GX costs CC and moves all damage counters from this Pokémon to your opponent’s Active Pokemon. This might compliment well with the new Alolan Ninetales-GX, as both benefit from its pre-evolution. When you’re facing an Ultra Beast deck, you turn to Sublimation; if you’re not facing any Ultra Beast, then you turn to Ice Path. This provides you more options if you use both old and new, but the fact remains that both of them are weak to Metal. This card was reviewed by the crew once (https://www.pojo.com/COTD/2017/May/18.shtml) as the 12th best card of the set. It even won Worlds 2017 first place from the Senior Division! Now we get to the drawbacks. Ability lock acts as this ability didn’t exist. Glaceon-GX is your only lock in standard while Garbodor shuts all of them down in Expanded. Using up your items right away means Mysterious Guidance could be an effective 40 more damage for Trashalanche’s damage output, and it takes 10 items to OHKO the new Ninetales. Shrine of Punishments is a new commodity that slowly damages EX/GX Pokemon. Despite environmental drawbacks that can hinder this card, Alolan Ninetales-GX will revolutionize the TCG. Expanded has some Fairy type support as well as more Stage 2s to Target, but gets shut down cold by Ability lock and even item lock such as Trevenant and Vileplume that’ll still make Mysterious Guidance useless. I am not certain how this will do in Limited due to being in a small set that will eventually be in a enormous set. But assuming that is does, it is a good pull. Though as a Stage 1, you have to wait a turn to evolve, and you may be out of luck of one of them are prized. Conclusion: Alolan Ninetales-GX has a lot going for it that should be taken consideration when building a deck. Reliable item search is something very few cards have, and this is one of them. Alolan Ninetales GX (LOT 132) becomes only the third Pokemon to receive a second iteration as a GX Pokemon. Lunala GX and Solgaleo GX are the only others to have two different GX versions (I’m not counting the Lycanrocs since there’s a day type and a night type although they technically both have the same name). I’m not sure what that means – I’m not sure why Alolan Ninetales – other than the two feature Pokemon of the Sun and Moon era – was the first Pokemon to get a second GX version, but it is what it is. And it is a GREAT card. It has two terrible attacks – and don’t let anyone try to convince you otherwise. Snowy Wind’s seventy to the active and thirty to the bench is AWFUL especially considering it costs two attachments. Sublimation GX is good if you go up against Ultra Beasts, and if you do play Fairy Ninetales in Gardy, it’s definitely the GX attack of choice, way better than Twilight GX or Plea GX. And I suppose Snowy Wind does OHKO Jumpluff and a couple of thirties to the bench will take out a Natu and potentially a Skiploom if Jumpluff is prized or in hand (happens to me plenty of times). Overall, however, you can put this card in a lot of decklists and not feel bad about not adding any Fairy energy. I think the most popular choices will be Beast Ring, Rare Candy, Ultra Ball, and Custom Catcher. This card definitely gives a much needed boost to Stage 2 decks. In my Solgaleo GX deck it was great and allowed me to speed up the development of my Pokemon, making the turn 2 Sol Burst GX a lot more possible. It’s one of those cards like I said yesterday that you can now tech into anything with the advent of Ditto Prism. Alolan Ninetales GX is a universal card that you’ll see in a number of top decklists over the next couple of years. So now we know why they banned puzzles back at the end of August. Can you imagine how good this would be with Puzzle of Time? Regular readers are likely sick of me mentioning it, but if you’re new to our countdowns, here is a short explanation of the process. If you’re already familiar with it but decided to skip the first seven reviews, you may be surprised we’re only on fourth place, because we’re doing a Top 11 countdown this set, with something a little different for first place. Now that we’re all on the same page, our fourth-place finisher is Alolan Ninetales-GX (SM – Lost Thunder 132/214, 205/214, 225/214). This is already a little more complicated a review than it looks, as we already have Alolan Ninetales-GX (SM – Guardians Rising 22/145, 132/145, 150/145), Alolan Ninetales (SM – Burning Shadows 28/147), Alolan Ninetales (SM – Black Star Promos SM123), Alolan Vulpix (SM – Guardians Rising 21/145, 21a/145), Alolan Vulpix (SM – SM – BUrning Shadows 27/147), Alolan Vuplix (SM – Ultra Prism 30/156), and Alolan Vulpix (SM – Lost Thunder 53/214). At least we don’t have to worry about other Ninetales or Vulpix cards; even though they share part of the name, the way TCG mechanics work, the Evolution lines are totally separate. Starting with Alolan Ninetales-GX (SM – Lost Thunder 132/214, 205/214, 225/214) itself, it is a Pokémon-GX; it may be more important than ever before to remember that the goodies Pokémon-GX come with (better HP, a GX-attack, often better effects overall) come at the cost of being worth an extra Prize when KO’d and dealing with anti-Pokémon-GX effects. There are a few, obscure effects which specifically benefit Pokémon-GX, but I haven’t seen many winning decks run Olivia. As a [Y] Type Alolan Ninetales-GX can benefit from [Y] support and hit all but the oldest [N] Types twice as hard due to Weakness. I don’t recall any anti-[Y] effects and nothing is naturally Resistant to them either. How much good any of this does Alolan Ninetales-GX is up in the air; smacking Rayquaza-GX extra hard is nice but that’s just one deck of at least half a dozen in the competitive metagame, and we’ll soon discuss why this Alolan Ninetales-GX is a more of a “general use” Pokémon. Being a Stage 1 is decent; being a Basic is better but a Stage 1 is still well within reason to run in most decks. The 200 HP is good but not great, falling outside of the typical OHKO range of a decent amount of decks, but a clutch Professor Kukui or Shrine of Punishment brings it back into range. Still, sturdier than most Basic Pokémon-GX or non-Pokémon-GX. The risk from [M] Weakness fluctuates pretty wildly. We’ll go from Kartana-GX being common TecH to being all-but-ignored. We’ll go from Metagross-GX decks being a strong, top-tier deck to being good but not great. [D] Weakness is about as good as Resistance gets right now, thanks to Zoroark-GX being such a common sight in decks, either as the focus or as support… except a Zoroark-GX backed by a full bench can swing for 120 damage with its “Riotous Beating” attack, so it can still 2HKO this Alolan Ninetales-GX even through Resistance. A Retreat Cost of [CC] can seem a hair awkward; not that stuff like Heavy Ball is worth the even more expensive Retreat Costs most of the time, but two is still significant enough you really need to include alternatives to manually retreating at full price. Plus, in the Standard Format, something like Escape Board only knocks it down to [C], unlike how Float Stone would zero it out entirely. Fortunately, there is a reason this [CC] is “friendlier” than similar costs, and that is due to the Ability. The Ability, “Mysterious Guidance”, is what makes this card. Item cards are fairly abundant in Pokémon, both in terms of cards released and in competitive plays. That is because they have no universal built-in cost; what keeps them from being an even greater presence in the average deck is the combination of lack of space and anti-Item effects. As great as many Item cards are, you HAVE to run some Pokémon in order to have a legal deck (let alone a competitive one) and you usually need some Energy and some Supporters as well. Mysterious Guidance is great for reinforcing a sound setup thanks to the many search Items like Ultra Ball, improving your offensive with a Tool like Choice Band, getting out of the Active spot cards like Escape Board or Escape Rope or Switch, etc. Throw in stuff like Counter Catcher, the new Custom Catcher, Crushing Hammer, Enhanced Hammer, Rare Candy… and you’ve got both niche tricks and essential deck setup that Mysterious Guidance can streamline. The attacks “Snowy Wind” and “Sublimation-GX” are much less impressive, but not worthless. Mysterious Guidance can work in almost any deck, but both attacks require [YC] to use; many decks could slip in a few Special Energy cards or basic Fairy Energy cards to cover the [Y] part of the costs, but the attacks don’t really warrant it. Snowy Wind does 70 to the opponent’s Active and 30 to one of their Benched Pokémon. Choice Band would allow it to 2HKO Pokémon-GX of equal or lesser HP than Alolan Ninetales itself but you not only have larger Stage 1 and most Stage 2 Pokémon-GX needing a third hit, you have some of the larger regular Pokémon as well. The Bench damage can mitigate some of this, or just be used to take out some of the smaller, more vulnerable targets… but still needing two or three attacks for the damage to accumulate. Sublimation-GX is almost good enough to warrant the Energy cost, at least right now; an automatic KO of your opponent’s Active Ultra Beast. It is a great option to have, but obviously not something to build one’s deck around. Putting everything about this Alolan Ninetales-GX together, we have a solid looking package for [Y] decks, but is the Ability alone enough to make it worth running in other decks? Here is where I finally get back to the other Alolan Ninetales and the Alolan Vulpix cards. All have at least a tiny, tiny bit of merit but MOST aren’t worth running alongside today’s Alolan Ninetales-GX. The reverse is not true, however; if you insist on running them, then definitely sneak in today’s card. You can read our review of the [W] Type Alolan Ninetales-GX here; when it first released it was actually competitive. Its usage has dropped off since then, however. Still, its first regular attack and its GX-attack only require [CC] and are decent, the former doing 50 to the opposing Pokémon of your choice while the latter shifts all damage counters from itself to your opponent’s Active. Not a high priority, however, especially if you have a deck that cannot afford to give up potential space for today’s Alolan Ninetales-GX since the two cards share the same name and thus you may only run four of them combined. Alolan Ninetales (SM – Burning Shadows 28/147) also received a review from us, but the other regular Alolan Ninetales (SM – Black Star Promos SM123) did not, and there are two reasons for that, one good and one not. The “not” one is that it is easy for us to miss promos, but the good reason is that Alolan Ninetales (SM – Black Star Promos SM123) just wasn’t worth the review; it is a [Y] Type but with filler stats and attacks. Alolan Ninetales (SM – Burning Shadows 28/147) is a [W] Type with a vanilla attack (80 damage for [WCC]) but it has the Ability “Luminous Barrier” that prevents attacks by your opponent’s Pokémon-EX/GX from affecting it. This allows it to wall against a deck without a good non-Pokémon-EX/GX attack, though this isn’t as useful as it once was. As it isn’t a Pokémon-GX, it counts as being a different name than Alolan Ninetales-GX, so you can run up to four of each… but they both have to Evolve from the same Basic Pokémon. Though the [W] Type Alolan Ninetales could use Archie’s Ace in the Hole if it was worth it (it isn’t). Just maybe consider one of it… wait, so what is it that makes today’s Alolan Ninetales-GX so good? Alolan Vulpix, specifically Alolan Vulpix (SM – Guardians Rising 21/145, 21a/145). The other three Alolan Vulpix all have some small benefit (“okay” free attacks or a slightly useful Ability), but this is the one that was so good we probably ought to have reviewed it on its own. I mean, I honestly that we had, and I hadn’t even had much luck with this card! I recognize that it is largely bad luck, however. This Alolan Vulpix has an attack for  that lets you search your deck for three Pokémon (any Stage) and lets you add them to your hand. Back in the day, I’d always get nailed by an N or Red Card, and while there are still cards like Judge in Standard, such disruption isn’t as prevalent now. You’re still taking a slow start to a deck, but you can now use Vulpix to open and – if your opponent ignores it – Evolve into today’s Alolan Ninetales-GX to get two Item cards. If this already works with a deck’s approach, it is pretty phenomenal. If a deck doesn’t already have room, whether we’re talking deck slots or Bench spots, I’m still not sold on squeezing in these two. Yes, after all that build up, I have to point out that part of me really does NOT like this combo. The thing is, I STILL included this on my personal list, and do recommend you try it. This nearly universally useful a combo basically needs to be eliminated from consideration, often through actual testing. Even if it means partially abandoning a major aspect of your deck’s strategy, such as booting something else to make room for Alolan Ninetales-GX or running it as the only Pokémon-GX in a non-Pokémon-GX deck. It WILL work out in some decks, and it will not work out in many other decks. This goes for Expanded as well as for Standard, I think. I know I sound like a broken record, but the usual conditions apply; more competition, more counters, and more combo potential. For general usage, it is a net negative, but not enough to crush the card’s score. I expect some nasty combo decks to emerge that make even the staunchest opponent’s of the banning of Puzzle of Time understand and agree with it (even if they still don’t like it). Alolan Ninetales-GX is amazing in the Limited Format, assuming it doesn’t hide in your deck. Try to run it in a deck where it can also attack, but it still can be worth the hassle just for the Ability alone. Remember, the above are composite scores, factoring in both the general and the deck-specific uses of the card. Alolan Ninetales-GX has been hyped quite a bit and it will probably be almost everywhere at first. I expect most decks to give it a try but also move on base on what results I’ve seen out of Japan. Think more Lycanroc-GX (SM – Guardians Rising 74/145, 138/145, 156/145) than Zoroark-GX. I haven’t read any newer results than that incomplete Top 32 from almost two months ago, so I could easily be mistaken. A final word of caution; I do not believe this is the savior of Stage 2 decks. Check out those above results while remembering how little space the typical Stage 2 deck can spare.